Cecil Drinkward (BS ’50, civil engineering) joined Hoffman Construction Company in 1967, later serving as president and now retired. Hoffman Construction has built many major structures in downtown Portland, Oregon, including the Convention Center and more than half of the modern office buildings. The company also built sewage and water-treatment plants and industrial facilities in the northwestern United States. 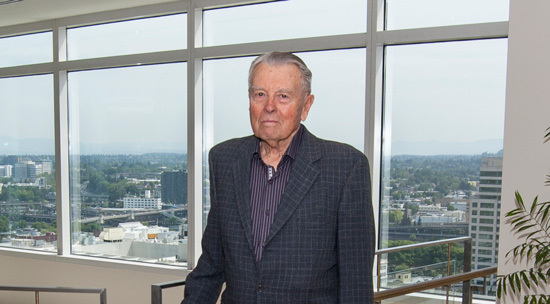 ENGenious sat down with Drinkward to learn about his experience as a Caltech student during the World War II years and how it has influenced his career. ENGenious: How did you experience Caltech as a student? Drinkward: I went there a year and a half out of high school at age 17, during World War II. I did my freshman and half of my sophomore years, and then I went into the navy for two years. I flew to Caltech after I was discharged and I still had my uniform on—I didn’t even have civilian clothes when I came back! I started classes sometime in March and the quarter had already started, so I had about eight weeks to finish a 10-week quarter. Eight weeks of school was really tough when you get back after serving in the navy. I managed to skate through by the skin of my teeth. I graduated in 1950 and went right to work in the construction industry. My first job was doing field engineering work at a large hospital in Denver for a contractor. ENGenious: Was your father a civil engineer? Drinkward: No, he was a construction superintendent. Both my parents were immigrants. He came from Holland and she came from Germany. They didn’t come here looking for any freebies, I know that. They came here to get a better life after World War I, when things were horrible in Europe. They had the intent of going back, which of course never happened. ENGenious: How did you decide to study at Caltech? Drinkward: I had grown up in San Gabriel and South Pasadena, and all I knew was Caltech was supposed to be the best place. Interestingly enough, I never applied to another school. I don’t even know what it’s like to get an application now for a school. At the time we got admitted, it was on the basis of an all-day test. ENGenious: Was it similar to what we now call the SAT? Drinkward: Yes. I thought the test was awful tough. I couldn’t answer some of the questions. There were several wise guys who said, “Oh, I knew all that stuff. I answered them all. This isn’t hard.” It made me think I would never get in. The other guys were too dumb to know what they didn’t know. And I never saw them in my freshman class. ENGenious: What was your Caltech graduating class like? Drinkward: My class was probably two-thirds veterans, including myself. It was an excellent learning environment because you had senior people that set a really good example. We were a very focused group. Just as an aside, I managed to meet Linus Pauling 30 years later to speak to him. I said I graduated in 1950, and he said the classes of 1950 and ’51 were the best students he ever had because they were all focused on getting an education. ENGenious: How has your civil engineering degree helped you in your career? Drinkward: I never did civil engineering as such. What I did was construction. The best thing civil engineering did for me was that the structural engineers I worked with wondered how I fit in, and when I would say I graduated from Caltech, they were impressed. If we were in a meeting and an issue came up, I would give an opinion, and it would be looked at as an engineering opinion, in addition to the construction feasibility. That was a big plus. ENGenious: Is there a project that you’re most proud of or that you found the most challenging? Drinkward: It was probably the Trojan Nuclear Plant, which has since been decommissioned and torn down. That was at the start of the nuclear program at Portland General Electric (PGE). It was just so different technologically. At that time, there was no precedent for building these plants, so in a way it was a pioneering nuclear plant. There was nothing to compare with, which made it interesting to me. ENGenious: What’s next for the field of civil engineering? Drinkward: I think the biggest challenge is the aging infrastructure of the United States. There’s got to be better and more cost-effective ways to do it than we did it in the past, with more longevity built in. We can’t just build a road like we did 50 years ago. People don’t have the money to do it over. This includes roads, bridges, airports, other civil structures and projects, including wastewater and water-treatment facilities. We need cheaper and better ways. ENGenious: There is a tendency to think that most of the problems of civil engineering have already been solved. How much more can you innovate? Cement is still cement. Drinkward: Well, cement is one that I think can be improved. It still shrinks. It cracks. It has a series of problems that you have to accommodate. Maybe it can be made better so you don’t get all that shrinkage. I always felt that reinforced concrete was the best way to build for the right structures, but the whole engineering of reinforced concrete has a lot of advances that could be made. ENGenious: What are some of the ingredients needed to create a forward-looking civil engineering program? Drinkward: There needs to be an investment in teaching the latest in materials research and structure research. We also need to be able to—and willing to—think out of the box when training the next generation of civil engineers. It is not just about using computers and following what’s been done before. It has to be done better. So far, we’ve done so much that makes things more expensive, but not better.